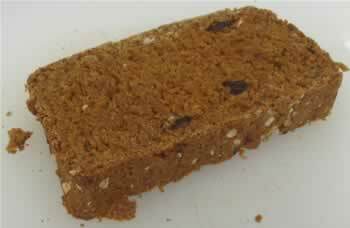 Our Carrot - Raisin bread contains less gluten and wheat, for healthier nutrition. Carrots have a sweet taste to them. Why NOT add carrots to your standard bread recipe, as a natural sweetener? This multi-whole grain Carrot - Raisin bread machine formulation contains more grain variety, and less gluten and wheat, than our previous whole wheat bread recipe. This recipe calls for four cups of flour, for each 2 pound loaf of bread. Bread flour is used for its gluten content. Whole-wheat flour is used as the standard whole grain. Rye flour, or any other exotic grain flour, such as Spelt is used for more grain variety in your diet. One cup of quick oats is used to counteract the high moisture content of the carrots. Due to the restricted use of gluten, the end result looks more like cake that is only 3 inches high rather than a sandwich size bread loaf. Of course, you can always add more gluten directly, for an additional bread rising effect. 7 ounces of Water for shredded whole carrot, or 9 ounces of Water when using dry carrot pulp. Carrots contain a great deal of water. In addition, different size carrots result in some variability to the final product. The best tasting bread is produced from hand shredding carrots on a cheese grater with medium size holes. Courser carrot shredding taste better in bread than using either carrot pulp made from natural juicing or shredded in a food processor. Still, bread baked with recycled carrot pulp produces an interesting texture, which has a somewhat nutty taste to it. Oats naturally contain no gluten, except by contamination. Quick oats are obviously NOT true flour. 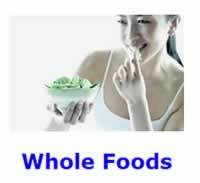 Nevertheless, they cost less than real oat flour and are widely available for purchase in most grocery stores. When baked with insufficient water, this bread ends up being more crumbly due to the use of quick oats. Use of more olive oil is required than in the standard bread recipe. The extra oil increases the bioavailability of the carotenes contained in carrots. As, well, as make the quick oat bread more moist and less crumbly. For bread machines, add one layer of carrot shredding or pulp after each cup of flour is poured into the pan. After one layer of carrot shreddings, be sure to sprinkle on a couple small handfuls of raisins. Using a separate dough rising cycle in your bread machine, gives you an opportunity to remove the bread machine paddle, as well as check for the moisture content of the dough. If your bread dough is too sticky, simply add additional quick oats in quarter cup increments, in order to prevent your bread from caving in from too much water. The use of quick oats rather than flour, also, adds an interesting white spotted look to the exterior of the bread crust. Then simply kneel the dough well and flatten down into the bread machine pan with your fist. Next, bake on the standard 3 hour default bread cycle, to allow for a second dough rising. This article was originally published on 12/18/2012.